Strife between the state and people over food, at various points of time in the past 400 years, has created some memorable outcomes in Russian history. 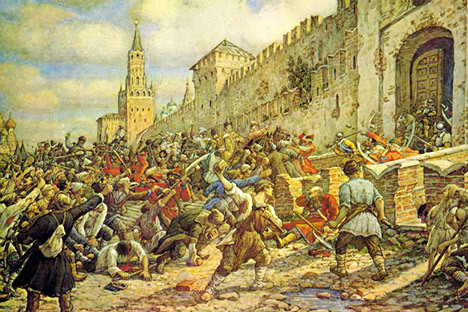 1) A tax imposed on salt in 1648 led to the Salt Riot, during which rioting Muscovites set fire to the city centre, and also killed four boyars. To negotiate with the rebellious crowds, Tsar Alexei Mikhailovich Romanov was forced to convene an advisory body – the Zemsky Sobor - and adopt the Sobornoye Ulozheniye (Legal Code); the first printed body of laws in the Russian Empire. 2) Around 500,000 people took part in the riots following a decree promulgated by Tsar Nicholas I, forcing people to plant potatoes. This law remained in force for ten years until an educated farmer, after reading holy books, spread rumours through the village that eating potatoes was a sin. 3) One of the most famous events of the 1905 Revolution was a revolt by sailors on the battleship ‘Potemkin’, portrayed by Sergei Eisenstein in a film of the same name. The sailors refused to eat soup made from rotten meat, and took up arms against the ship’s commanders. 4) In 1914, the state banned the sale of wine which, by 1917, cost the state treasury a huge 2.5 billion rubles in lost revenues and led to an unmanageable accumulation of alcoholic beverages. Due to the frequent riots, the looting of wine cellars and inability to sell the wine to the other countries, the Military Revolutionary Committee decided to destroy wine and alcohol stockpiles in Petrograd. So into the gutters they poured 15,000 buckets of wine. 5) An estimated eight million people died of starvation in the Ukrainian SSR, Byelorussian SSR, Northern Caucasus, Volga Region, Southern Urals, Western Siberia, and Kazakhstan in the years 1932 and 1933, as a result of collectivization and ‘dekulakization’, and the Soviet leadership’s refusal to accept humanitarian aid from other countries. 6) As part of Khrushchev’s massive campaign to develop a new system of agriculture, corn was planted on 37 million hectares of fertile land in 1962. The following year, a grain crisis erupted in the country, and bread cards had to be issued. In 1964, Khrushchev was removed from power. 7) 1.8 million cans of coffee, seized as contraband, were crushed in February 2009 by the Federal Property Management Agency in Kaliningrad Oblast. 8) 40,000 kg of king crab legs, classified as edible, were crushed, dried, and burned on the Kamchatka Peninsula in December 2010, because of the fact that poachers had illegally caught these crustaceans. Condensed version of material from Kommersant.